A century-old kopitiam in Penang gets a visit from a billionaire. WHEN my friend Julie Ang, who helps out at the Kong Thai Lai Coffee Shop in Hutton Lane, told me about Robert Kuok’s recent visit there, I had to go and see for myself what was so special about the place. After all, billionaire hoteliers don’t pop in to have a cup of coffee in any old kopitiam. “He came here at the beginning of July,” confirmed proprietor Gary Tan, 52, “and had a cup of our local home-brewed black coffee. He enjoyed it so much that he then ordered another 8kg of the powder to take away!” Framed articles of the visit, reported in the Chinese press, take pride of place on one wall. This humble coffee shop is a true relic of days gone by. Established over 100 years ago and now passed on to Tan via his grandfather and father, it was a centre of the community. Local residents, regardless of race or religion, would pop in to escape the debilitating heat of the afternoon sun, relishing the casual, friendly atmosphere. There’s no need for expensive air-conditioners; the shady interior is kept cool by ceiling fans and the thick tiled walls. The local coffee they serve is strong, so sweet and thick it is almost treacly, and guaranteed to put a coating on your tongue. Prices have gone up 10-20 sen to 90 sen – RM1.10 depending on whether you order a kopi (coffee with condensed milk) or kopi-o (black coffee), and their pnuar chneh sek nooi (soft boiled egg) is now served in trendy shot glasses, but apart from that, not much else has changed. Certainly the kitchen at the back has remained the same since the place was built, and the front dining area houses an eclectic mix of mismatched tables and chairs, probably as a result of newer items being brought in to replace knackered old ones. Some are probably originals. 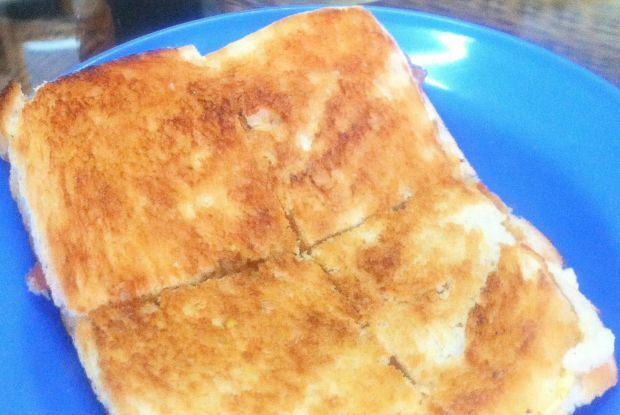 Nothing goes better with a good, strong cup of local coffee than toast and kaya (coconut jam), and you can order their Roti Kiap aka Roti Kahwin – two slices of white Hainan bread, one spread with butter and the other with kaya “married” together. They are so airy, it’s like eating a light, crispy cracker. Although the bread is supplied to them, the kaya is made in-house from the same traditional recipe they have always used. It is a slow, painstaking process which takes some seven to eight hours as the santan (coconut milk), sugar and 70-egg custard is cooked in an old biscuit tin over a low heat. It is stirred every few minutes to prevent curdling and also to stop the bottom from sticking and burning. The final step is the addition of caramelised sugar to give it its customary satiny, brown finish. “Our kaya is popular,” Tan said, “because it is home cooked the traditional way with no preservatives.” None is needed, really, because despite making a whopping 20kg batch each time, during a busy week, they may need to replenish two or three times. The kaya is also available for purchase in jars. Whether it is the kopi, the Roti Kiap or indeed the kin jay p’nui (economy rice) which is available at lunch time, some of their loyal customers have been going there for decades. It is a favourite place for local businessmen to congregate, where they can while a few hours away, k’hakkok (chit chat) with friends, wheeling and dealing over a cup of the local brew. It’s a place for everyone, whether rich or poor – even Mr Honda himself, Loh Boon Siew, was apparently known to have frequented it several times a week. 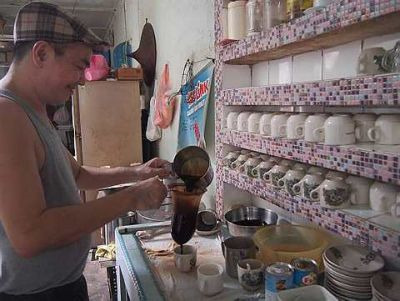 Khor Kang Chai, 63, has been going there for his regular coffee fix for the past 50 years, and despite having to give up coffee for health reasons now, he makes it a point to drop in daily, sometimes even twice a day. “I used to go for martial arts classes around the corner,” he reminisced. Hot stuff: Gary Tan making coffee that keeps the customers coming back. At least it was, until recently, when it was thrust into the limelight by the hotelier’s visit, a situation not necessarily popular with some of their other regulars. “Oh no, not more press coverage! There won’t be any room left for us soon,” moaned Peter Ng, Lee’s old school mate. Kong Thai Lai Coffee Shop is at 6 Hutton Lane, Penang. Opening hours: 7.30am-5pm (3pm on Saturdays); closed on Sundays.